Don’t wait until Sunday! Sunday! Sunday! to watch this epic retro highlight reel of monster trucks, insane dragsters, dirt bikes, chaos, destruction and all that is right with the world. It’s so rad that I just grew a Miami Vice ‘stache just thinking about it. This collection of too awesome to believe clips comes from the U.S. 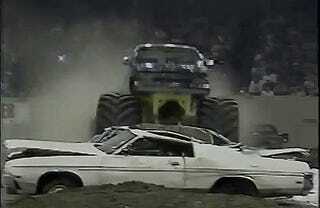 Hot Rod Association, the group that made monster trucks a household name. They didn’t just do monster trucks, though, as you can see from this collection of other incredible stadium-based motorsports, such as mud bogging and pulling. Live at the Super Ultra Mega Crush Dome of Greater East Computer Screen! They’ll sell you the whole seat, but you’re only going to need the edge.